At Godwin Hurley Donoghue, residents of Buffalo, New York, can depend on experienced, professional and thorough services after being seriously injured. We have extensive knowledge in a full range of personal injury matters, including motor vehicle accidents, truck collisions and construction accidents. At our law office, we are also proficient in obtaining compensation for injured railroad workers under the Federal Employers Liability Act. Our clients come to our law office concerned about their futures. Understandably, they are afraid they will be unable to return to work or have the funds necessary to continue their medical care and make a full recovery. If their injuries left them disabled, they are worried about providing for their families. They are often frightened of the grueling legal process ahead of them and afraid they do not have the knowledge or endurance to stand up to powerful insurance companies or opposing counsel. Fortunately, we are more than prepared to assuage our clients' worries and ready them for their case. We are committed and passionate about injured clients' rights, having won numerous verdicts and settlements for past clients. We strive to remain accessible to clients and their families during each stage of their case. At our law office, we pride ourselves in our compassion and empathy, as well as our ability to impart some of our knowledge to clients and give them back the power and dignity they lost after their injury. 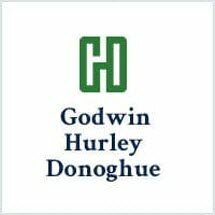 We offer a free initial consultation at Godwin Hurley Donoghue, during which we will develop a strategy that has the best chance for success.